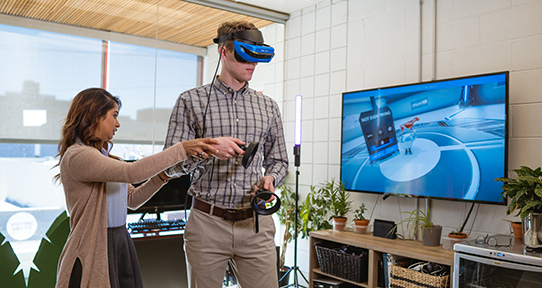 Co-op placements like Tania Akter’s time at LlamaZoo working on virtual reality software will give you the experience you need to start your career. The Co-operative Education Program (co-op) is an integral part of your engineering studies at UVic. It helps you sample different job prospects and gain critical work experience while you practice and apply the knowledge and skills acquired during your studies. While it takes a little longer to complete a co-op degree, it’s well worth it—you graduate with significant experience for the job market. Through co-op, you can alternate terms in class with paid work terms in jobs related to your field of study. Co-op is mandatory for BSEng students, and to graduate with a BSEng degree, you must complete a minimum of 16 months of co-op work (4 work terms): you graduate with the co-op designation on your academic documents. Work terms are normally four months in length; however, you can combine work terms to create an 8-, 12-, or even 16-month period of work (counting as 2, 3, and 4 work terms, respectively). Under special circumstances, you may be able to complete a portion of the needed work experience by utilizing periods of half-time work coupled with half-time study. If you have extensive relevant work experience prior to entering the BSEng Program, or if you completed appropriate work terms at another certified post-secondary institution, you may be able to challenge or transfer credit for up to 8 months of work experience. Regardless of the extent of prior work experience, you must complete at least 8 months of your work experience while registered at UVic. Approval of special arrangements is at the discretion of the Director of the BSEng Program and the Executive Director of Co-operative Education, or their designates. What can I do on a co-op term? There are lots of possibilities for your co-op terms: they can be entrepreneurial, in the private sector, in academic research, or with the government. Even international co-op terms are possible.